NASCAR elected to go on with the Dayton 500 today after Kyle Larson's wreck at the same track yesterday, when his car's engine flew through the protective fence and into the crowd before debris injured 28 spectators. 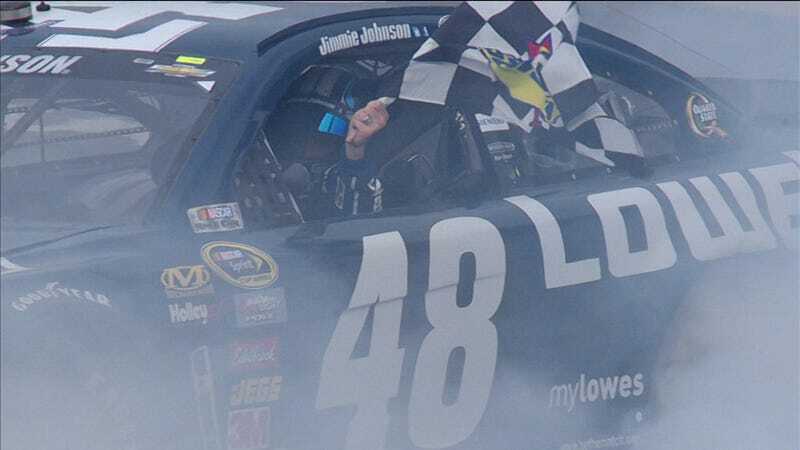 Jimmie Johnson won the race for his second career victory at the Daytona 500, but the biggest news was perhaps made by driver Danica Patrick, who finished eighth. After being the first women to ever to start in pole position, she led the race at times and even found herself in third place on the final lap before eventually fading and finishing seven places behind Johnson. With the finish, she became the first woman to ever end a Daytona 500 race inside the top 10. Dale Earnhardt Jr. finished second, and Mark Martin finished third. Favorites Tony Stewart and Kevin Harvick were in the race, but were part of an early nine-car wreck that left them out of contention. No one was injured, but it definitely reminded onlookers of yesterday's horrifying crash on the final lap. After yesterday's wreck, it's fair to question NASCAR's clear conflict of interest in allowing drivers to continue to finish the race following a crash on the final lap. Though it's exciting as hell and entertaining to spectators who undoubtedly watch and attend races for the crashes, events like yesterday's, which left a child in critical condition and another onlooker with life-threatening injuries, can and will happen every now and then.